Katie's Cards have designed a new festive animated ecard in order to meet the demands of Christmas and continue to maintain high levels of customer satisfaction. Katie’s Cards, premium online ecard provider, have created a new animated ecard just in time for Christmas. The new ecard, a light hearted, humorous sketch featuring a naughty snowman, is a welcome addition to the large collection of seasonal ecards and interactive games available to send from their Christmas category. The seasonal period typically sees large numbers of consumers looking to buy gifts and cards for loved ones and it is these demands that Katie’s Cards are satisfying with a varied range of environmentally friendly, low cost Christmas Ecards on offer. Giving and receiving is at the heart of Christmas, making it the peak season for the sending of greeting cards. In recent years the recession has encouraged customers to seek out cost effective and practical Christmas solutions. However, although looking for low cost solutions, they still want to offer something that is of a high quality and Katie’s Cards new ecard, along with the rest of their collection, advocates this desire with entertaining and engaging animated e-greetings. The new addition to the Katie’s Cards collection will be the second Ecard in a series featuring the ‘naughty snowman’ character who causes havoc as he tries to disrupt the seasonal celebrations. 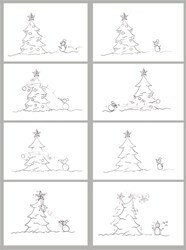 This ecard features the snowman trying to destroy a Christmas tree with snowballs. As he knocks off the decorations, the star at the top of the tree catches his eye. Throwing a snowball at it, the star falls on to his head resulting in a humorous twist whereby his head ends up on the top of the tree. The light hearted nature of this ecard makes it a versatile card that it is suitable for everyone. Their large Christmas ecard category provides a diverse array of styles with interactive ecard games as well as sophisticated, elegant and humorous ecards. Katie’s Cards is a small, family-run, ecard company based in Teddington, Middlesex. The ecards on the website are exclusively available to members of the Katie’s Cards website who can send unlimited ecards for the duration of their subscription. For more information and to preview the ecards, please visit katiescards.com. Copyright information: This article is free for reproduction but must be reproduced in its entirety, including live links & images; this copyright statement must be included. Visit katiescards.com for more services.